Here’s a trick I learned from Kathleen Dunphy: I tone my canvas yellow before I paint on it. Many artists over time have worked on toned grounds. (The “ground” is the surface one paints on.) The white of a bare canvas is just too intimidating or too harsh, so painters tone the canvas with a thin layer of color. 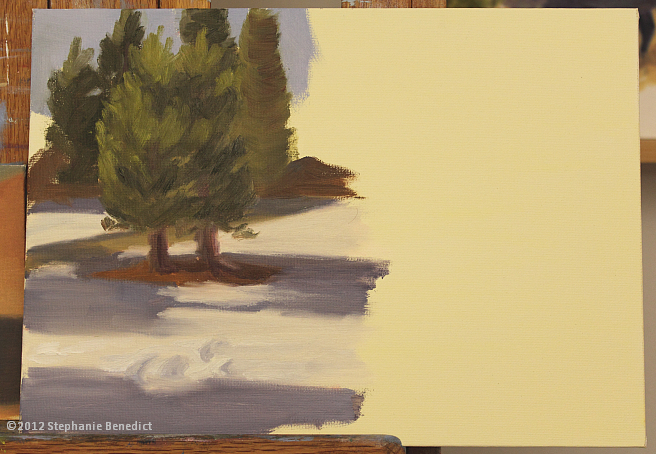 A plein-air study of two pine trees in snow. The right-hand side shows the yellow-toned ground. I toned this panel with a thin layer of gesso tinted with Hansa yellow medium acrylic paint. The traditional color for toning canvas is raw sienna, which will give the canvas a warm, slightly orange-y color. I’ve tried that, and it’s OK. Others use burnt umber or red or a mixture of colors. After I began studying with Dunphy in 2008, I explored a number of options: raw sienna, quinacridone burnt orange (which is like raw sienna only brighter), neutral gray, burnt umber. Eventually I came to agree with Kathleen: I like yellow the best. So now I tone all my canvases with a pale wash of cadmium yellow light or Hansa yellow before I paint. Now, too much yellow can be a distraction at first, and make it hard to judge the relative color and value of the first paints I put onto the canvas. But the payoff is huge: the yellow gives an underlying warmth to the canvas, which complements cool paintings on cloudy days and highlights the warmth of sunny days*. The traditional method is to thin a little bit of oil color into a lot of solvent and wash it onto the canvas either with a brush or a rag. Then you have to let it set up before you start painting. A more modern way is to use a bit of acrylic paint thinned with water and wash it onto the canvas with a rag. But the representatives at Gamblin Colors (which makes oil paints and mediums) convinced me that perhaps that’s not the best method, so most recently I’ve started adding a touch of yellow acrylic paint to white gesso, and adding a layer of colored gesso. I typically use pre-primed panels or canvas, so my colored layer doesn’t need to be thick or completely covering: I’m not trying to build a whole new ground. And I can make the yellow then very pale. Yes, it takes a bit of planning, but I like the results. If you’re a collector, can you tell if your paintings have toned grounds? If you’re an artist, do you tone your canvas first? *I’m not sure this would work for the painter who works in the Henry Hensche, full-spectrum colorist style. In that style, that extra warmth might conflict with the finished painting. But with a more limited palette, it works just fine. Hi Stephanie. I came to your blog via Kathleen Dunphy’s website. I’ve been using watered-down burnt sienna (acrylic) as a toned ground for my oil paintings. I’m going to try the method you suggest, using either cad yellow or hansa. Any suggestions as to ratio of pigment to gesso? Just eyeball it? Thanks. I would say that, if you are using gesso, use a smidge of yellow in a pool of gesso (maybe a quarter teaspoon?). The yellow can be very bright, and I like a milder version. You could try just thinned acrylic paint. Just put a little on a dampened paper towel and wash it on. Again: “little” is the important part. After that, eyeball it. Good luck! Let me know what you think. And thanks for stopping by.